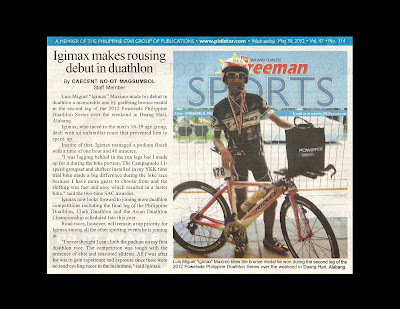 CEBU, Philippines - Luis Miguel “Igimax” Maximo made his debut in duathlon a memorable one by grabbing bronze medal in the second leg of the 2012 Powerade Philippine Duathlon Series over the weekend in Daang Hari, Alabang. Igimax, who raced in the men’s 16-19 age group, dealt with an unfamiliar route that prevented him to speed up. Inspite of that, Igimax managed a podium finish with a time of one hour and 40 minutes. "I was lagging behind in the run legs but I made up for it during the bike portion. The Campagnolo 11-speed groupset and shifters installed in my YKK time trial bike made a big difference during the bike race because I have more gears to choose from and the shifting was fast and easy which resulted in a faster time," said the two-time SAC awardee. Igimax now looks forward to joining more duathlon competitions including the final leg of the Philippine Duathlon, Clark Duathlon and the Asian Duathlon Championship scheduled late this year. Road races, however, will remain a top priority for Igimax among all the other sporting events he is joining in. "I never thought I can climb the podium on my first duathlon race. The competition was tough with the presence of elite and seasoned athletes. All I was after for was to gain experience and exposure since there were no road cycling races in the meantime," said Igimax.